We are living in an age of explosive data growth. IDC projects that the digital universe is growing 50% a year, doubling in size every 2 years. In media and entertainment, the growth is even faster as capacity-intensive formats such as 4K, 8K, and 360/VR gain traction. Fortunately, new trends in data storage are making it easier to stay ahead of the curve. 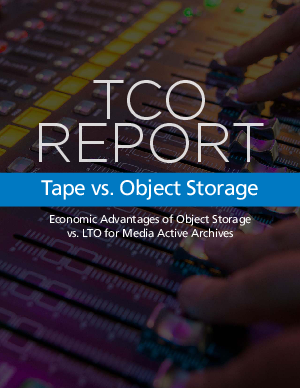 In this paper, we will examine how object storage stacks up against LTO tape for media archives and backup. In addition to a detailed total cost of ownership (TCO) analysis covering both capital and operational expenses, this paper will look at the opportunity costs of not leveraging the real-time data access of object storage to monetize existing data. Finally, we will demonstrate the validity of the analysis with a real-world case study of a longstanding network TV show that made the switch from tape to object storage. The limitations of tape storage go way beyond its lack of scalability. Data that isn’t searchable is becoming a tangible liability for businesses, and one that will only become larger with advances in AI and machine learning.